On Sunday morning Engine 11-2 headed into Hagerstown to the Hagerstown Fire Department Training Center to assist with a MFRI (Maryland Fire & Rescue Institute) with a Fire Fighter 1 Class. The PVFC has two of their vary own participating in this class (PVFC President McMillen & Recruit Bak). Engine 11-2’s crew (Engineer Hunter, FireFighter Burns, Firefighter Cain) assisted the MFRI Instructors in going over Engine Company and Water Supply Operations (Pulling and advancing , Hoselines, Laying out Supplyline, Hooking to Hydrants, Setting up and establishing a Fill Site and Draft site and yes even repacking all that hose. 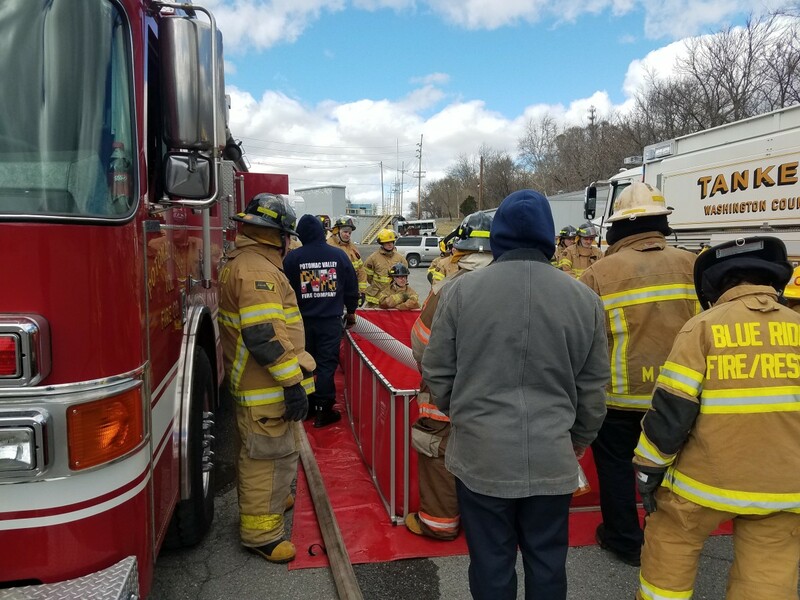 The PVFC would like to wish all the recruits Good Luck with their up coming test and Thank the crew from Engine 11-2 for assisting .